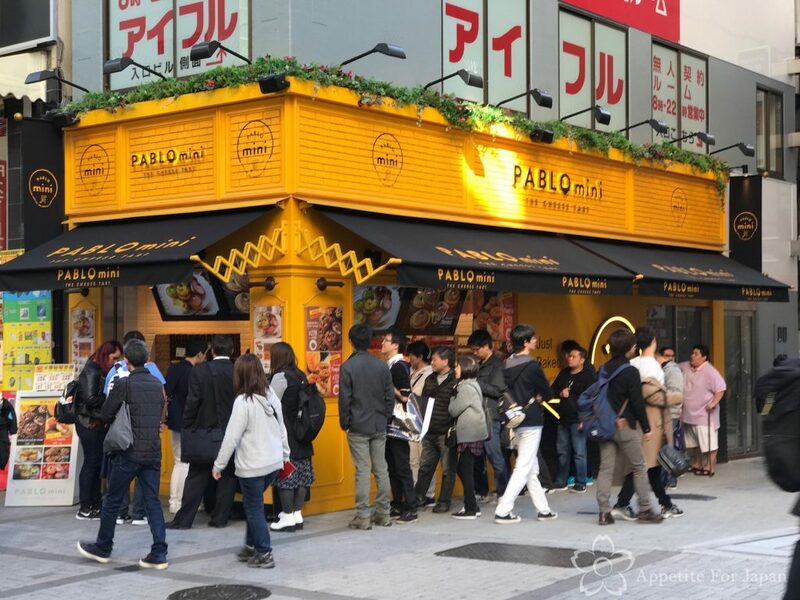 Pablo (パブロ) is a chain of cafes found around Japan, famous for their delicious cheese tarts. They also have a number of Pablo Mini outlets where you can buy mini cheese tarts on the go. 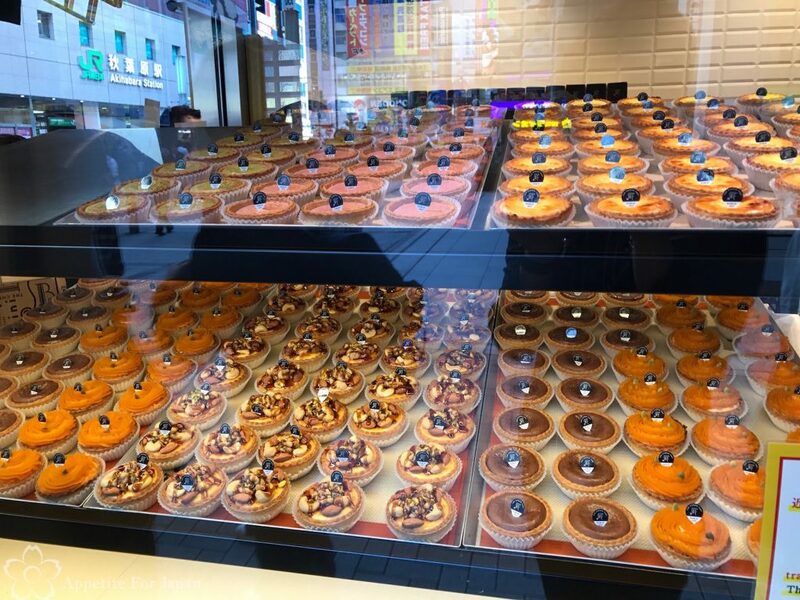 We joined a respectably long queue to taste test the Pablo Mini cheese tarts in the Tokyo suburb of Akihabara (秋葉原 or Akiba – 秋葉 – for short). Let me start by saying that for the full Pablo cheese tart experience, you’re probably best to go to a Pablo cafe where you can sit down and choose just how cooked you want your freshly baked cheese tart (yes, kind of like ordering a steak, but we’re talking baked cheese cakes here). For those of you who don’t have the time to seek out a Pablo restaurant and dine in, Pablo Mini is your alternative. Okay, so Pablo Mini is actually pretty slow when it comes to fast food. That line may not look particularly long, but we queued up immediately after I took this photo, and it took 25 minutes to reach the counter. I am not exaggerating. Why? Because in Japan, everything is done with the utmost of precision, and this takes time. A lot of time. 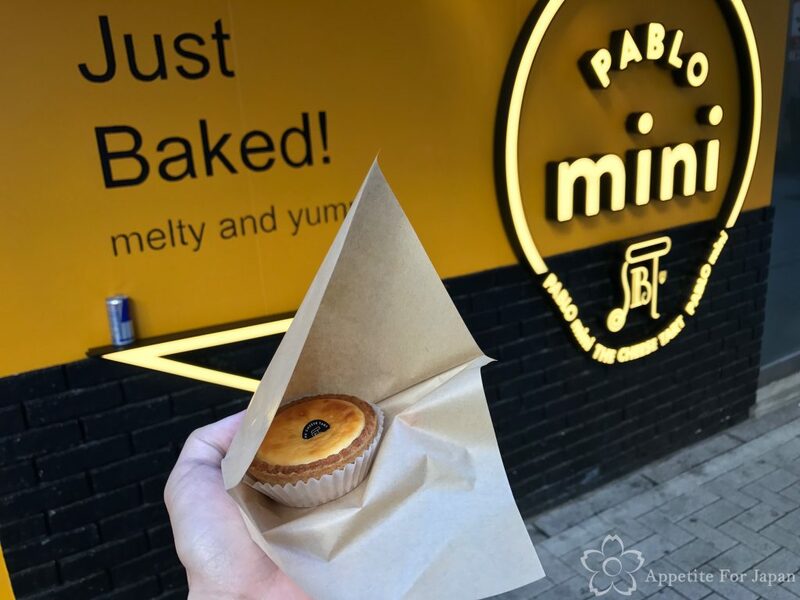 Naturally, packing cheese tarts for customers at the Pablo Mini kiosk is carried out with the same precision and time as anything else. 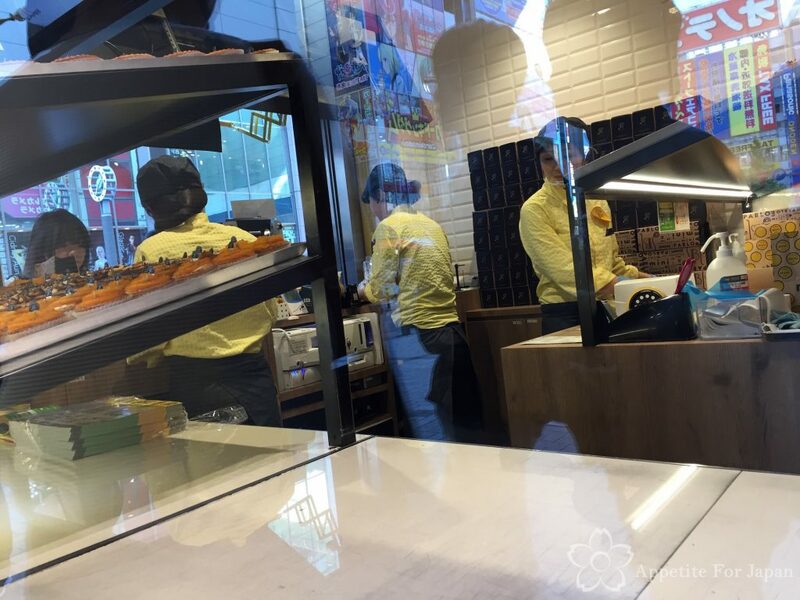 Three staff members are visible in my above photo, and there were at least five of them in the kiosk while we were lining up. Even by Japan’s standards, I was surprised at how time seemed to stand still as we eagerly awaited our cheese tarts. Perhaps they work in slow-motion to keep the queue nice and long, to create interest in what must be a very popular treat! At long last, we reached the front of the queue and bought our cheese tarts. That’s the original, plain cheese tart in the above photo. 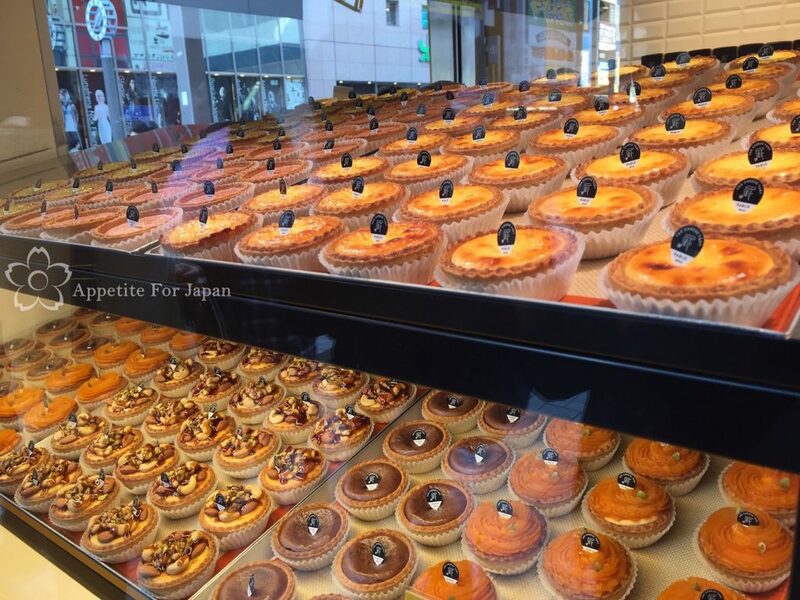 The mini cheese tarts are quite small, but we found that one was enough per person (that, and there’s so much to eat in Tokyo that we’re always conscious of leaving room for everything else we plan to eat each day). The sign in the background claims that the tarts were “just baked”. I’m assuming that they probably were baked that day, but unlike the eat-in Pablo cafes, the mini cheese tarts aren’t baked while you wait. This means that they’re not going to be quite as good as the genuinely freshly baked ones that you’ll get in the cafes, but they’re still good. 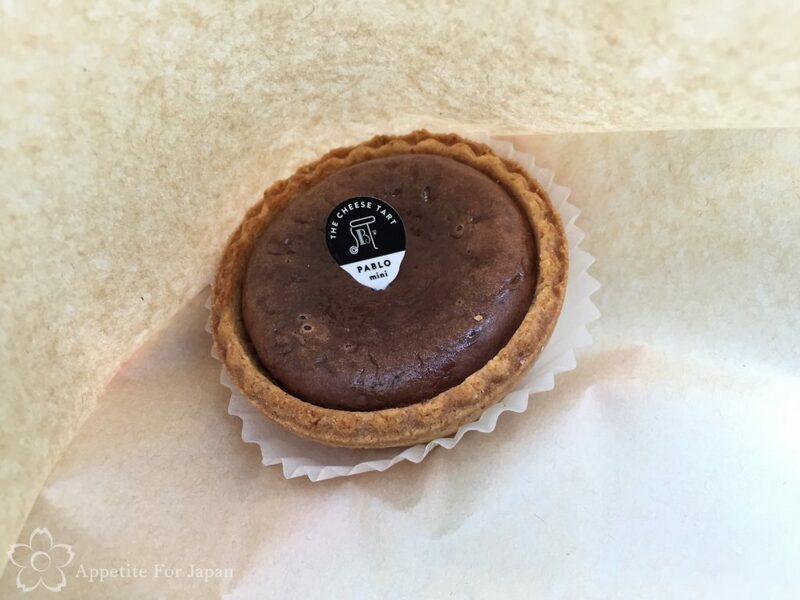 Above: We also tried the ‘rich & creamy chocolate’ mini cheese tart, which is one of the standard flavours. Now that I’ve shown you what the cheese tarts look like, I’ll explain what they are. Imagine a cross between a baked cheese cake and an egg tart. Now imagine an egg tart that has cheese cake for its filling, but it’s gooey and creamy and delicious. It’s sweet with a little bit of cheesy tang. Now, I don’t even like normal cheese cakes, but I’m a big fan of Japanese cheese tarts! Like the cheese tarts in the eat-in cafes, Pablo Mini cheese tart flavours vary from season to season. Whilst you’ll always find the plain cheese tarts and the chocolate ones on the menu, depending on the time of the year you might find flavours including pumpkin, taro, the ever-popular matcha cheese tarts, strawberry, apple and cinnamon and more. 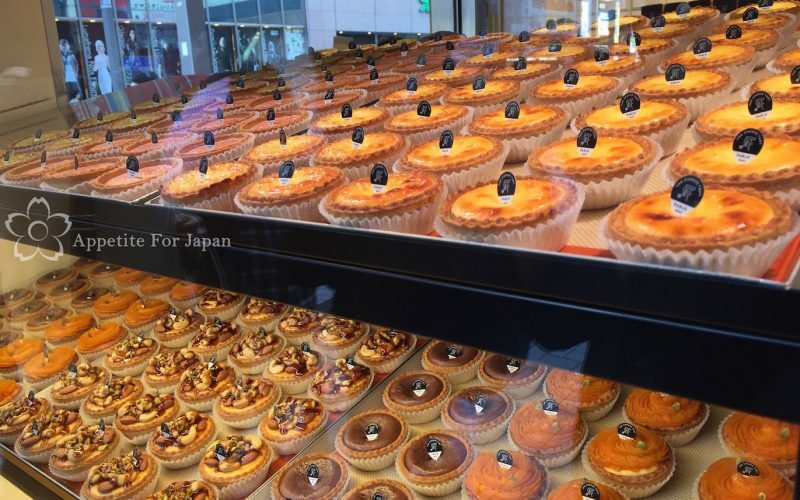 At Pablo Mini Akihabara, you can select your cheese tarts individually, or you can purchase a box of six tarts. Note that if you’re buying a box of six, you won’t get to choose which six tarts you’ll get, as the combinations are set (after all, they love arbitrary rules in Japan). Would I recommend Pablo Mini cheese tarts? If you can’t get to a dine-in Pablo cafe, then yes. However, given the choice I would recommend going to one of the cafes for the full Pablo cheese tart experience. Pablo Mini Akiba is really easy to get to. Simply catch the train to JR Akihabara Station, and take the ‘Akihabara Electric Town exit’. 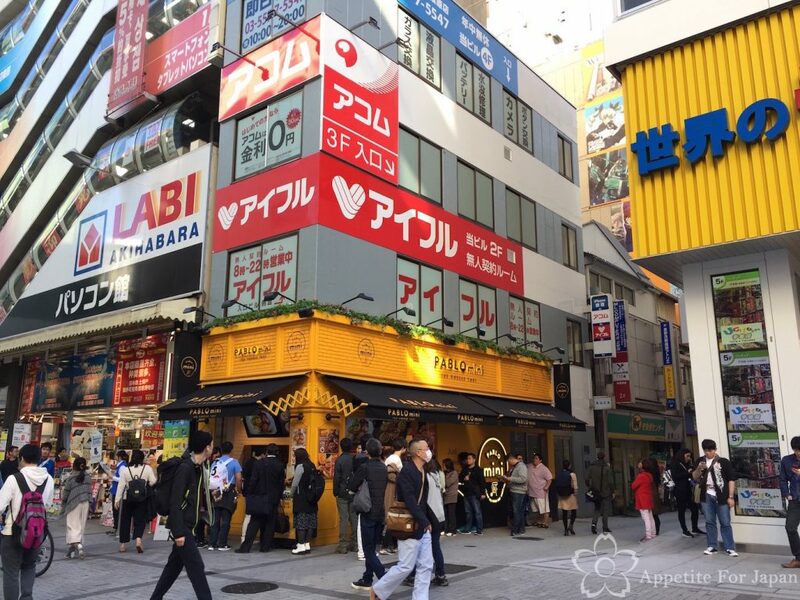 Look for the yellow kiosk on the corner underneath the Labi Akihabara building.